These girls do exactly what you think they do! 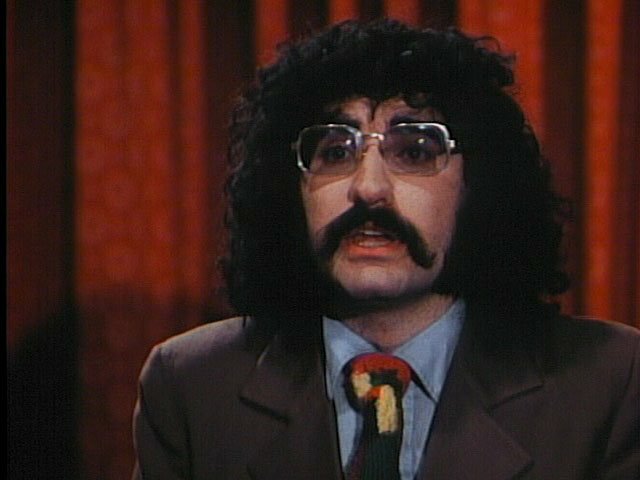 Eugene Levy is an ugly, ugly man. That thought kept running through my mind over and over again while I was watching this flick. I’ve always found him to be a bit creepy looking, but to see him back in the early 70′s sporting a huge afro, mutton chops, and mustache is something else altogether. He looks like the mutant offspring of Gene Shalit & Tony Iommi. Now that I got that verbal abuse out of my system, I can comment on his performance in the film – it’s actually really good. Eugene’s talent for improvisation is obvious, even at such an early stage in his career. Andrea Martin & Ronald Ulrich also do a great job fleshing out the threadbare script with a lot of witty, off the cuff dialog. The good folks at Shout! Factory have quickly become a horror & exploitation fan’s best friend with their top notch dvd and blu-ray releases. 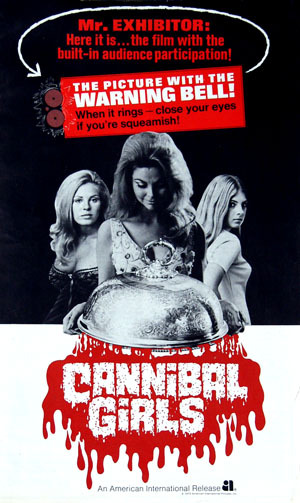 CANNIBAL GIRLS is no exception. This special edition dvd release marks the long overdue debut of the film on home video in the States. Even a bare bones dvd release would have been cause for celebration, and this special edition release – which is loaded with bonus features gets the party started in a BIG way. The “scrumptious” bonus material includes brand new interviews with director Ivan Reitman, producer Daniel Goldberg, and none other than Eugene Levy himself! There’s also radio spots, the original theatrical trailer (which rules), and an alternate audio track that features the infamous William Castle styled “WARNING BELL,” which supposedly warns tender-tummied viewers of any upcoming carnage. Best of all, the warning bell doesn’t really work. It usually starts a bit after the blood, or stops short before the gore is gone. They don’t call them exploitation flicks for nothing! Consider this one Brain Hammer approved and highly recommended. This entry was posted on March 18, 2013 at 6:56 pm and is filed under Uncategorized. You can follow any responses to this entry through the RSS 2.0 feed. You can leave a response, or trackback from your own site.